As the presidential election gets closer and closer I’ve been seeing more and more politically-powered t-shirts, bumper stickers, hats, yard signs and just about everything else you could think of showing up all over the place. But, come to find out that these different things are just the tip of the iceberg with there being many more ‘odd’ items that you can now buy as a way to support your potential president-to-be. Apparently I wasn’t the only one who has noticed all of this new presidential promotional propaganda because one of our very own Hubbers NYLady created a Hub on this very subject called 10 Zany Election 2008 Products. 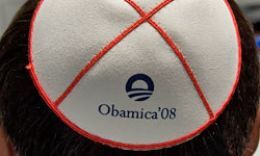 The Hub is a great read and one of the more interesting items that she lists is the ‘Obamica’, which is described on vanitykippah.com as …a play on the Hebrew word “Kippah,” or Yarmulke, that is made of suede from the finest cowhide…. I wrote a Hub yesterday, “10 Zany Election 2008 Products,” and it included a mention and photo of the “Obamica,” an Obama yarmulke. The company makes one for McCain supporters, too, and a Sarah Palin lipstick version. Anyway, today I got a Facebook message from the guy who makes these and he’s sending me one. Thanks to Hubpages for my new yarmulke. I’m Roman Catholic, but hey, I’ll take it. Thank you, Ryan! I’ll be checking the mail for my new Obamica. I hope it fits! I think that anyone who voted for Obama are complete FOOLS!!! Really, think about who you are voting for; A MUSLIM!!! Think about this people, Muzlims are allowed to lie and decive people. So, with that being said, what do you think Obama is going to do? HE WILL LIE TO EVERY LAST ONE OF YOU!!! I read on the news that the day after he became president, and guess what?!!? Russians(knon to want to take over the world) told the president that they would change their origanal military plans(having their NUCLIAR BOMBS) repositioned(they are now on the border of Russia where they can attack us)!! Well guess what else? As EVERYONE KNOWS, since Obama is a fool, he’ll do nothin about it. WE ARE DEAD PEOPLE!!!!!! !